Who invented the Refrigerator? The name of the person credited with inventing the Refrigerator is Carl von Linde (1842 - 1934). Carl von Linde is not only famous as the German inventor of the Refrigerator but also as a scientist, engineer and businessman. When was the Refrigerator invented? Carl von Linde invented the Refrigerator in 1876, during the Second US Industrial Revolution / Victorian period of invention (1850 - 1914). Definition of the Refrigerator: The Refrigerator is defined as a storage cabinet or appliance for keeping food cool by means of ice or mechanical refrigeration. Fact 1: Who invented the Refrigerator? The Refrigerator was invented by Carl von Linde in 1876 during the Second US Industrial Revolution era of inventions (1850 - 1914) which was a breakthrough addition to advancements made in the area of Household Items. Fact 2: Who invented the Refrigerator? Prior to the invention of the Refrigerator in 1876, it was possible to have ice delivered but this could only be afforded by extremely wealthy people who had ice houses or ice boxes. Fact 3: Who invented the Refrigerator? The majority of people made use of a 'cool pantry' or a larder to store perishable food and milk for a short amount of time, approximately 2 days. Others made use of a cool cellar to help to preserve their food. Fact 4: Who invented the Refrigerator? Food that perished quickly was consumed the next day and milk was often delivered on a daily basis. Before the invention of the refrigerator most ordinary people favored preserved food by using preservation methods such as pickling, canning, salting, drying or smoking meat and fish or preserving fruit by making jellies and jam. Fact 5: Who invented the Refrigerator? The advent of the Industrial Revolution and the on set of the Age of Electricity encouraged inventors to look for ways to keep food cold, slowing down the activity of bacteria so it took longer to spoil the food. Cold temperatures help food stay fresh longer. The man that is credited with inventing the refrigerator is Carl von Linde. Fact 6: Who invented the Refrigerator? The inventor of the Refrigerator, Carl von Linde, was born on June 11, 1842 in Berndorf, Germany and died on November 16, 1934. Fact 7: Who invented the Refrigerator? The early years of Carl von Linde were spent in Berndorf, Bavaria, Germany where he was raised by his family. His father was a Lutheran minister. Carl von Linde was educated at ETH Zurich (Swiss Federal Institute of Technology) where he studied engineering. Fact 8: Who invented the Refrigerator? Following his education his first job was in 1868 as a teacher at the Technische Hochschule in Munich. Fact 9: Who invented the Refrigerator? Carl von Linde was friends with Gabriel Sedlmayr, who worked at the Spatenbrau brewery. Gabriel Sedlmayr suggested to the young engineer the idea of developing a refrigeration system that would make year-round beer brewing possible. Fact 10: Who invented the Refrigerator? Bavaria had a cold-brewing culture that shut down in April until the Autumn brewing season. Bavarian beer was stored , or "lagered" in caves packed with ice that were laboriously cut from lakes in the winter. Fact 11: Who invented the Refrigerator? In 1873 Carl von Linde succeeded in his project by inventing mechanical refrigeration for beer storage tanks. By 1874 Linde had developed a methyl ether refrigerator and by 1876 he had invented an ammonia-compressor refrigerator. Fact 12: Who invented the Refrigerator? His friend Gabriel Sedlmayr was overjoyed as Carl von Linde had made it possible to make lager beer in any season of the year. The invention of mechanical refrigeration led to the rise in sales of lager all over the world as it stored and travelled better than ales. Lager would eventually dominate the world of brewing. Fact 13: Who invented the Refrigerator? At more or less the same time Scottish-American inventor David Boyle (1837 - 1891) had independently designed an ammonia refrigerating compressor to make ice which he patented in 1872. Fact 14: Who invented the Refrigerator? In 1879, Linde gave up teaching and founded the "Linde's Ice Machine Company". His company was an international success and the process of refrigeration quickly displaced ice in food handling and various industrial processes. By the turn of the century, nearly all breweries had a refrigerator and nearly all meatpacking plants used refrigerators. Refrigerators were installed at the Guinness brewery in Dublin, Ireland in 1894. Fact 15: Who invented the Refrigerator? The success of the Refrigerator enabled Carl von Linde to concentrate on other areas of scientific research and by 1902 had developed a method for separating pure liquid oxygen and nitrogen from liquid air. He transferred his company to his sons Friedrich and Richard and to his son-in-law Rudolf Wucherer. Fact 16: Who invented the Refrigerator? Carl von Linde died on November 16, 1934 but his pioneering work on refrgeration led to many innovations in the areas of cryogenics, chemistry and engineering. Fact 17: Who invented the Refrigerator? The invention of the commercial Refrigerator eventually led to the development of the domestic Refrigerator. In 1913, Fred Wolf developed the first domestic refrigerator which was an ice box and a mechanical unit. Fact 18: Who invented the Refrigerator? 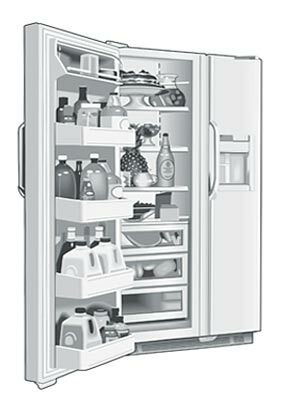 In 1914 Nathaniel Wales developed a more practical refrigerator with an electrical system evolved into the Kelvinator. Fact 19: Who invented the Refrigerator? In 1918, General Motors purchased the Guardian Frigerator Company and renamed it to Frigidaire. In 1923 Frigidaire introduced the first self-contained unit using the tagline "No more ice". Fact 20: Who invented the Refrigerator? Sears launched its Coldspot line of electric refrigerators in 1928. But the boom in sale of domestic refrigerators happened in the 1930's when Electrolux began selling their domestic refrigerator, marketed to Americans as "a compact product for the modern kitchenette". Fact 21: Who invented the Refrigerator? The electric refrigerator did not take off in Britain until the 1950's when a sweltering heat wave prompted sales of the product. Fact 22: Who invented the Refrigerator? The invention of the fridge changed our lives forever. A convenient time safer that ensures food stays cold and fresh.